To open by saying this debut LP from Kellerkind, who has appeared on the likes of Hive Audio and Stil Vor Talent in the past, is summertime house music would be unfair without first pointing out that not every day in the dry season is the same. Unlike the weather though there aren’t many disappointments on here. Those looking for warm, live sounding arrangements to perfectly soundtrack the impending days spent outdoors, beer in hand, could do far worse than the opener Jazz Cafe then, though granted it’s not particularly house-y. More a sprightly, piano-led, stepping downbeat number, that it invokes Nu Yorican Soul’s Black Gold of The Sun is certainly not doing it any disservice. From here things do step up into a gear more suited to clubs proper. The certainly-not-ironically-titled Disco On The Dancefloor, its head nodding bass, string and synth stabs fall nicely into Triple Distilled‘s slightly more cosmic take on things, so before you know it the decidedly more jacking It’s 2AM has arrived. A strong contender for standout arrangement of the album, it’s full of angry schoolgirl vocals and dark, throbbing basslines, which are contrasted with a rather whimsical flute-like hook. This kind of forward-moving fare proves to be the defining memory of Basement Story, despite the fact it’s a style that doesn’t represent the majority of tracks on the album. This is by no means to say deeper, less dramatic outings like the hypnotically percussive, near-tribal Bollwork aren’t highly worthwhile too though (those that remember the Big Chief imprint should take note, and imagine that sound in today’s marketplace). But you can’t, or perhaps shouldn’t have an LP made entirely from heads down singles, and thankfully that has been remembered in this instance. 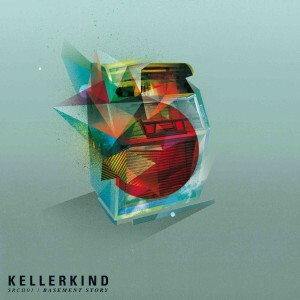 Kellerkind’s debut is also helped out by some standout remixes, one of the highlights being Channel X’s mainroom, squelching bassline, prog-techno outing, along with Animal Trainer’s snarling edit of Triple Distilled, which marries an almighty analogue melody with slightly scary strings and bleeps- atmospheric stuff to say the least, especially when a saxophone arrives to create a breakdown that would make you think Laurent Garnier was somewhere close by. Like we said, few disappointments, many fine moments, here’s hoping the weather follows suit.